I usually don't have the patience for tape manicures - I'm constantly ruining them by taping way too early in the drying process. But, yesterday I managed to contain myself enough to do this. It's a base of OPI's My Boyfriend Scales Walls with a stripe of Sinful Colors' Out of this World and a strip of L'oreal's The Queen's Ambition. 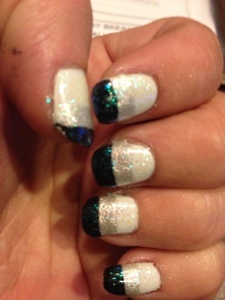 I was kind of dull looking when I finished so I topped it off with a light coat of Confetti's Ice Ice Baby.